To live well in the world one must be able to enjoy it: to love, Freud says, and work. Dejection is the state of being in which such enjoyment is no longer possible. There is an aesthetic dimension to dejection, in which the world appears in a new light. In this book, the dark serenity of dejection is examined through a study of the poetry of Hopkins and Coleridge, and the music of "depressive" black metal artists such as Burzum and Xasthur. The author then develops a theory of "militant dysphoria" via an analysis of the writings of the Red Army Fraction's activist-theoretician, Ulrike Meinhof. 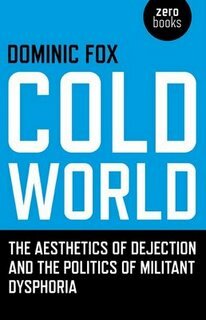 The book argues that the "cold world" of dejection is one in which new creative and political possibilities, as well as dangers, can arise. It is not enough to live well in the world: one must also be able to affirm that another world is possible. In the brilliant red doom of a Hampshire Sunset Brigit Conti can hear a voice behind her ears that is not her own. Bed-bound, and complaining of a rare bone disease that no Doctor can diagnose, her husband fears that the house they have purchased is a portal through which an older, more malign energy has passed, possessing his wife and son. Through their successive deterioration his secular and agnostic world-view undergoes a metamorphosis, drawing him to a strange man from the hills: the Rector, their unlikely saviour. Or are he and his family merely victims of their own self-serving yuppie way of life? 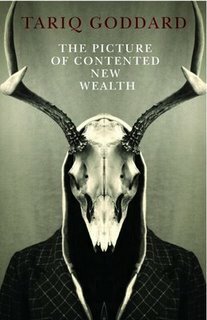 'You were the picture of contented new wealth' is a gothic tragedy set in the nineteen eighties, bringing proper characterisation and a literary sensibility to the traditional horror story. It's mix of generic elements and mystical realism deal with the irreducibility of evil and its successful normalisation in to our daily and dominant reality. This book is a defence of Modernism against its defenders. In readings of modern design, film, pop and especially architecture, it attempts to reclaim a revolutionary modernism against its absorption into the heritage industry and the aesthetics of the luxury flat. 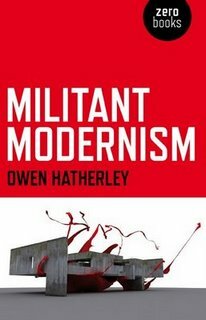 Militant Modernism argues for a Modernism of everyday life, immersed in questions of socialism, sexual politics and technology. It features new readings of some familiar names - Bertolt Brecht, Le Corbusier, Vladimir Mayakovsky - and much more on the lesser known, quotidian modernists of the 20th century. The chapters range from a study of industrial and brutalist aesthetics in Britain, Russian Constructivism in architecture, the Sexpol of Wilhelm Reich in film and design, and the alienation effects of Brecht and Hanns Eisler on record and on screen. Against the world of 'there is no alternative', this book talks about things we haven't done yet, in the past tense. Modern art is a mass phenomenon. Conceptual artists like Damien Hirst enjoy celebrity status. Works by 20th century abstract artists like Mark Rothko are selling for record breaking sums, while the millions commanded by works by Andy Warhol and Francis Bacon make headline news. However, while the general public has no trouble embracing avant garde and experimental art, there is, by contrast, mass resistance to avant garde and experimental music, although both were born at the same time under similar circumstances - and despite the fact that from Schoenberg and Kandinsky onwards, musicians and artists have made repeated efforts to establish a "synaesthesia" between their two media. This book examines the parallel histories of modern art and modern music and examines why one is embraced and understood and the other ignored, derided or regarded with bewilderment, as noisy, random nonsense perpetrated by, and listened to by the inexplicably crazed. 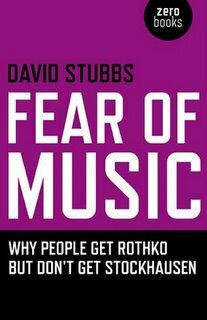 It draws on interviews and often highly amusing anecdotal evidence in order to find answers to the question: Why do people get Rothko and not Stockhausen?